What exactly is Lock-Out/Tag-Out? Lock-out/Tag-Out (LOTO) refers to specific practices and procedures to safeguard employees from the unexpected energization or startup of machinery and equipment, or the release of hazardous energy during service or maintenance activities. According to the Occupational Safety & Health Administration, (OSHA) this requires, in part, that a designated individual turns off and disconnects the machinery or equipment from its energy source(s) before performing service or maintenance and that the authorized employee(s) either lock or tag the energy-isolating device(s) to prevent the release of hazardous energy and take steps to verify that the energy has been isolated effectively. If the potential exists for the release of hazardous stored energy or for the re-accumulation of stored energy to a hazardous level, the employer must ensure that the employee(s) take steps to prevent injury that may result from the release of the stored energy. · Verify the isolation and deenergization of the machine. Electrical Safety Specialists (ESS) will help with your Lock-Out/Tag-Out needs. They provide customized LOTO procedures for your facility, in which the procedure includes step-by-step LOTO labels for each equipment location. The labels will have photographs of your equipment and customized instructions to obtain a mechanically and electrically safe work condition. ESS experts will work hand in hand with your maintenance personnel. If your employees service or maintain machines where the unexpected startup, energization, or the release of stored energy could cause injury, the standard likely applies to you. The standard applies to all sources of energy, including, but not limited to: mechanical, electrical, hydraulic, pneumatic, chemical, and thermal energy. Employees can be seriously or fatally injured if machinery they service or maintain unexpectedly energizes, starts up, or releases stored energy. 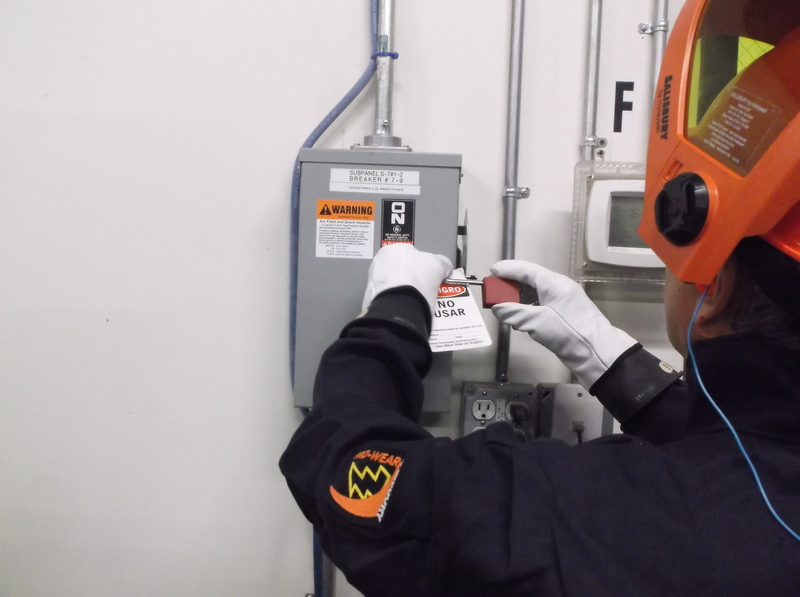 OSHA’s standard on the Control of Hazardous Energy (Lock-out/Tagout), found in Title 29 of the Code of Federal Regulations Part 1910.147, spells out the steps employers must take to prevent accidents associated with hazardous energy. The standard addresses practices and procedures necessary to disable machinery and prevent the release of potentially hazardous energy while maintenance or servicing activities are performed. 1. BALDWIN, Ill. – U.S. Minerals LLC in Baldwin has been cited for six safety violations by the U.S. Department of Labor’s Occupational Safety and Health Administration for failing to provide fall protection, personal protective equipment and to implement procedures to control hazardous energy. The company faces $195,470 in penalties after a July 2013 inspection found repeat violations at the Baldwin facility. BRIDGEPORT, Conn. – The U.S. Department of Labor’s Occupational Safety and Health Administration (OSHA) has cited Emhart Teknologies with 22 alleged serious, repeat and other-than-serious violations of safety standards at its Shelter Rock Lane plant in Danbury, Conn. The maker of fasteners, wire and brass inserts for the automotive and aerospace industries faces a total of $79,000 in proposed fines. Bellevue, OH – Wilbert Plastic Services has been cited for 10 safety and health violations, including Lock-out/Tag-out and PPE failures. These failures resulted in one injured employee, and $48,900 in proposed penalties. 4. Bumble Bee tuna worker cooked to death in oven; Cal/OSHA issues fines – The death of a worker who was accidentally cooked to death in an industrial pressure cooker has resulted in fines for Bumble Bee tuna company. · provide permit-required confined space training to employees working inside the ovens. The last two violations alone accounted for $25,000 in fines. On Oct. 11, 2013, employee Jose Melena, 62, had been assigned to load a particular oven with large baskets stacked with tuna at Bumble Bee’s plant in Santa Fe Springs. He entered the 54-inch by 36-foot oven to make an adjustment to a chain inside. When Melena wasn’t seen for a while, a search for him was conducted because his car was still in the facility’s parking lot. After searching for 90 minutes, an employee suggested looking in the last oven that had been loaded. 1. OSHA finds workers exposed to amputation dangers at San Angelo woodworking manufacturer; company, staffing agency fined $63K. …repeatedly failing to train workers in Lock-out/Tag-out procedures Read more about US Department…repeatedly failing to train workers in Lock-out/Tag-out. Call ESS at (816) 925-0443 for a free quote on Lock-Out/Tag-Out.